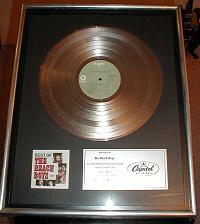 Record Awards Beachboys Best of the Beachboys "Platinum" Presented to the Beachboys Capitol Records In-House Award Floater with Capitol Label and number on back US $ 6500.00 Click Here to see a photo of the item. 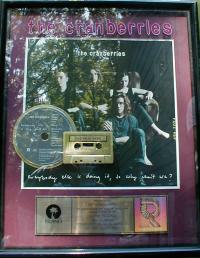 Record Awards Cranberries Everybody Else Is Doing It, So Why Can't We - Cassette and CD "Gold" Award RIAA Certified Presented to Cranberries US $ 350.00 Click Here to see a photo of the item. 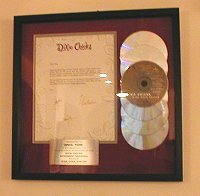 Record Awards Dixie Chicks CD Award For Wide Open Spaces with Letter Signed By Dixie Chicks To Record Company Executive US $ 550.00 Click Here to see a photo of the item. 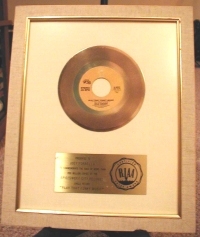 Record Awards Elton John Island Girl Gold 45 Award Presented to John Reid RIAA US $ 1250.00 Click Here to see a photo of the item. 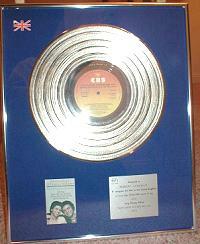 Record Awards Johnny Mathis And Denise Williams - Silver LP Award That's What Friends Are For Presented to UK Record Company Executive UK $ 450.00 Click Here to see a photo of the item. 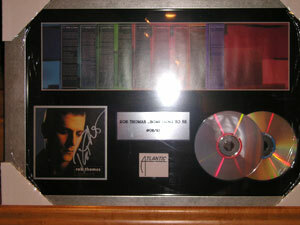 Record Awards Rob Thomas Something To Be # 08/10 Award Signed By Rob Thomas US $ 1500.00 Click Here to see a photo of the item. 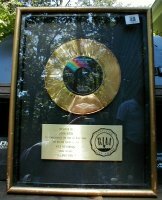 Record Awards Wild Cherry Play That Funky Music Gold 45 Award White Matte RIAA Certified Presented To Record Company Executive US $ 500.00 Click Here to see a photo of the item.